Free and busy time is the focus of this semi-smart wearable. Last year, What Watch introduced its Stop the Time watch, which offered a minimalistic flourish of smart technology on top of a classic wrist-worn timepiece. 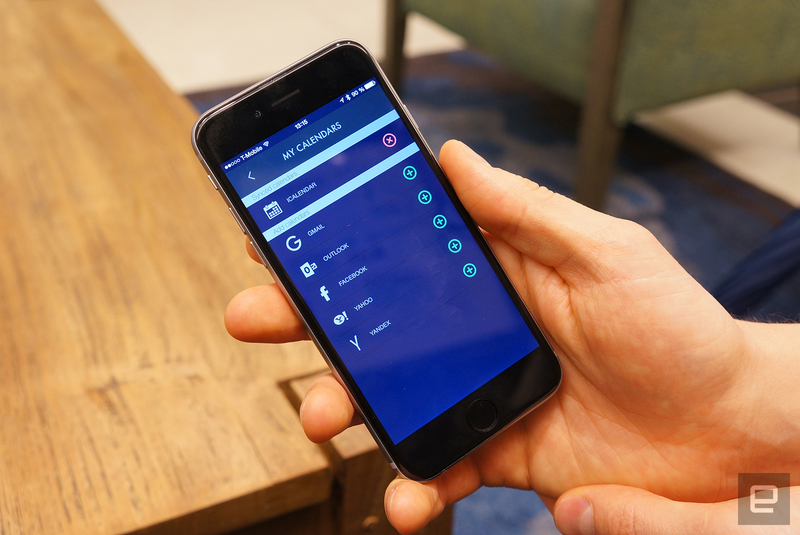 The idea was to purposely limit the feature set, freeing users from data overload through a conceptual design. With the press of a single-use button, you could mark up to five "moments" each month, which lit up elements on the watch's e-ink display. This month, the company is back with another technologically restrained wearable, the Calendar Watch. It still avoids data overload by keeping things simple: You can look at the time and also see your schedule at a glance. 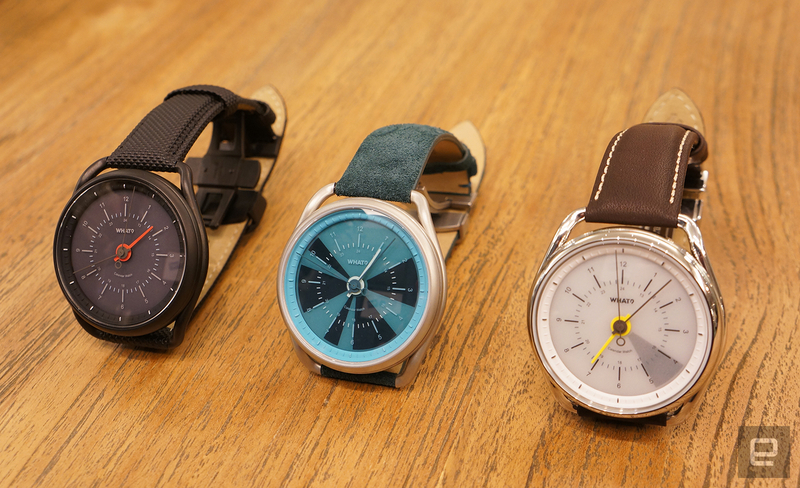 The product just launched on Kickstarter, but we got a chance to speak with What Watch co-founder Igor Basargin and take a look at the first batch of prototypes. They won't help you track steps or control a playlist, but the pie-wedge schedule view seems a useful addition to a pretty decent-looking watch. At first glance, the Calendar Watch seems like a basic timepiece, but you'll notice the differences on closer inspection. Analog hands and numerical indicators sit on a clear sheet above an e-ink display, which shows the wedge-shaped schedule blocks that give it its name. There's no crown or controls on the 47mm-wide stainless steel exterior either -- the time and display are all controlled by your smartphone. This helps make it waterproof to five atmospheres (50 meters), which is good for showering and shallow swimming. The watch hardware is secured between two removable metal rails (lugs), and while the straps may look traditional, they're hiding foldable solid links for quick release. Three styles will be available at launch: Polar White, Aqua Blue and Special Edition Black, with a selection of additional straps and lugs so you can customize the look. We're told the black model is the most popular one so far, but after seeing them in person, I'm currently championing the Aqua Blue. The smart functionality is based around the company's app pulling in free/busy data from your phone's calendars and translating that into a shaded wedge on the watch face. Right now, there's support for Outlook, Gmail, Yahoo, Facebook events and Yandex. Each hour on your watch references four 15-minute segments from your calendar, which will be shaded where a corresponding event or meeting is scheduled. Since the watches have a traditional 12-hour display, the app provides two ways to deal with seeing your full 24-hour day. Flexible mode shows you 12 hours ahead of your current time, erasing completed meetings as time passes. With fixed mode, you'll see a static schedule of 12 hours ahead from the moment you set it. Double-tapping the display while it's facing upward will show you a five-second preview of the next 12 hours. If you have reminders set for any appointments, the watch will vibrate and the display will blink for each one, giving you a heads-up about your upcoming meetings. In case your phone's battery dies, the watch retains a 48-hour backup of your schedule. You may not know where you're supposed to be, but you'll know you're missing something. As for the watch itself, it's rated for three weeks on a charge, although the model we saw had been running for four weeks. It was on its last legs, though. At 15 percent charge, the second hand will start to stagger instead of smoothly ticking along, and as the battery runs even lower, it will pause and jump in delayed 15-second segments. The charger is still being built, but the 3D-printed prototype leans toward a basic cradle design, so you'll need more than just a cable when you're traveling. Of course, the company is still fine-tuning the final design of the Calendar Watch. It's already received feedback about the poor visibility of the second and minute hands on darker-colored watch faces. Since the e-paper display isn't luminescent, some method of increasing the hands' visibility in the dark is also being considered. The Calendar Watch has already passed its goal on Kickstarter, and the company seems well on its way to delivering the final retail version for September 2016. The baseline model starts at around $480, which isn't cheap, but we're told it's the unavoidable result of high-end materials and a limited production run. Its smart functionality may be minimal by design, but it'll free you from notification overload while still keeping you on schedule at a glance.